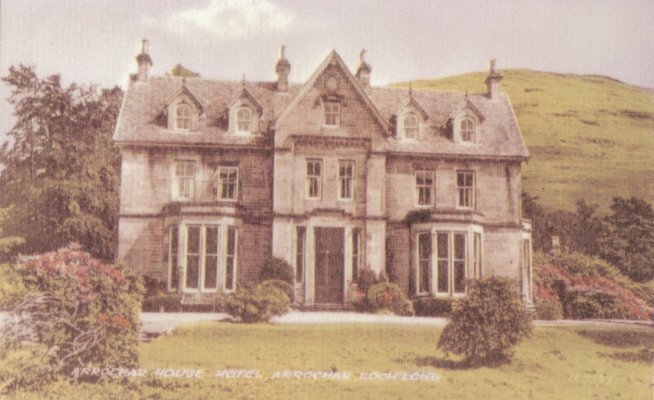 Arrochar House has had several names. 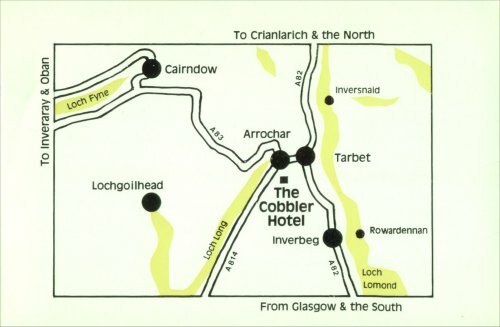 Over the years the name has changed from Inverioch House, to Arrochar House, to The Arrochar House Hotel, to The Cobbler Hotel and finally to The Claymore Hotel. 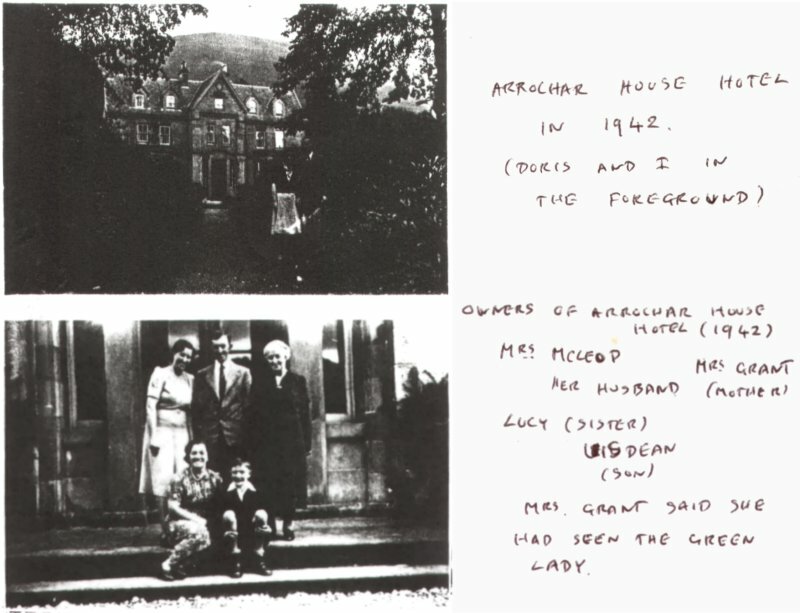 Arrochar House is a follow on from previous residences of the Chiefs of Clan McFarlane, so it is worth recording a little of the history of former buildings used by the Chiefs of Clan McFarlane, and the history of their lands. Gilchrist, founder of Clan McFarlane received a charter of the lands of Arrochar. 14th century Inveruglas Castle was built on the Island of Inver Douglas which became corrupted to Inveruglas. Inverbeg until recently, was known as Nether Inveruglas. 1654 Inveruglas Castle was bombarded by the troops of Cromwell and burnt down. 1724 Chiefs of McFarlane were living in Island I Vow at this date. Descendants of the Chiefs were living in Island I Vow as late as the late 19th Century. 1567-1625 During the reign of King James the sixth, the Chiefs of McFarlane stayed at Claddach Mor, Tarbet, which was a small three roomed thatched cottage. Descendants of the Chiefs of Clan McFarlane were staying in Inverhoulin and Clattach beg. 1697 The first part of Inverioch Castle or House was built by John, 19th Chief of McFarlane. 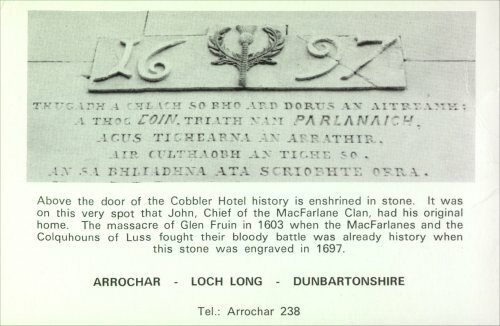 There is a stone still over the present front door to commemorate this date. This house was later to become Arrochar House and then the cobbler hotel. At the present time there is dispute as to whether the centre part or the rear part of the house was the first to be built. 1784 7th July The estates of McFarlane of Arrochar were sold to Ferguson of Raith. William Douglas of Brighton was the factor for Ferguson of Raith and he stayed in Inverioch House. 1787 The Duke of Argyll took a tack of lease of the lands of Arrochar. 1799 The second part of Inverioch House was added by the Duke of Argyll. 1821 The lands of Arrochar were sold to Colquhoun of Luss. After 1821 The third part of Inverioch House, the present front part, was added by Sir James Colquhoun of Luss. This last built part of the house, the present front of the house looks out over Loch Long, but when the first part of the house was built the front looked towards the McFarlane avenue of oak trees, and over towards Loch Lomond from where the MacFarlanes had come. 1834 28th Jan John Colquhoun, second son of Sir James Colquhoun of Luss, married Frances Sara Fuller-Maitland, had their honeymoon on the Isle of Wight, then travelled in their own carriage, with post horses, to their first home of Arrochar House, given to them by Sir James Colquhoun. 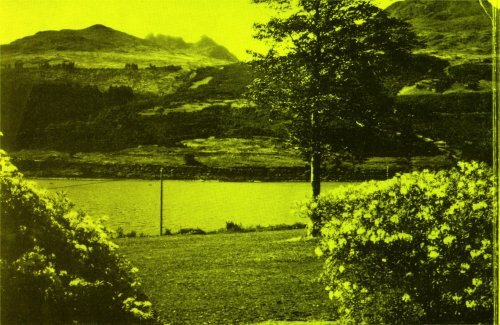 John Colquhoun and family left Arrochar House at some point but came back to Arrochar House to stay there between 1873 and 1884. 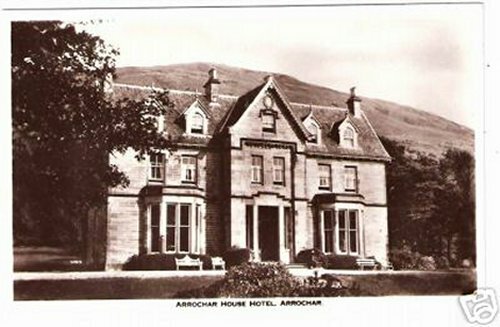 By 1950 Arrochar House was owned and being run as a temperance Hotel by Mrs Annie McLeod. 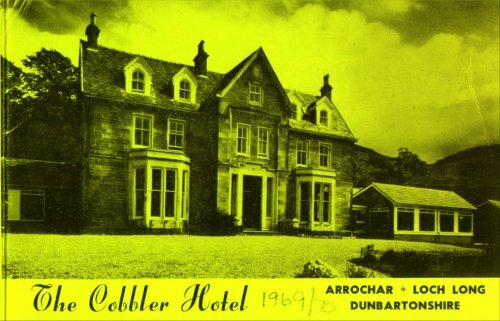 1970's Then Bobby Campbell from Alexandria, bought Arrochar House and changed the name to the Cobbler Hotel, adding a new extensions to the side. 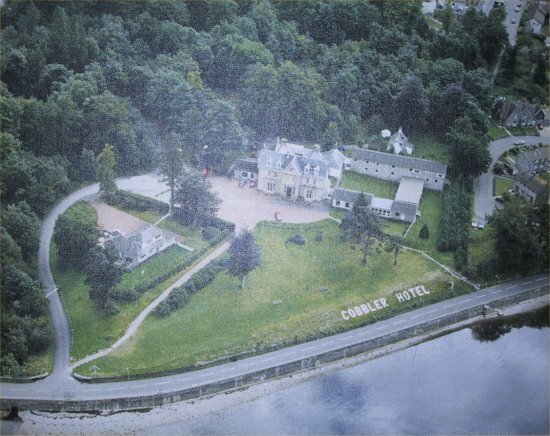 He also built the cottage at the front of the hotel - Cruachan - now a bed and breakfast. 1980's Pam and Maurice Root-Reid bought the hotel from Bobby Campbell. 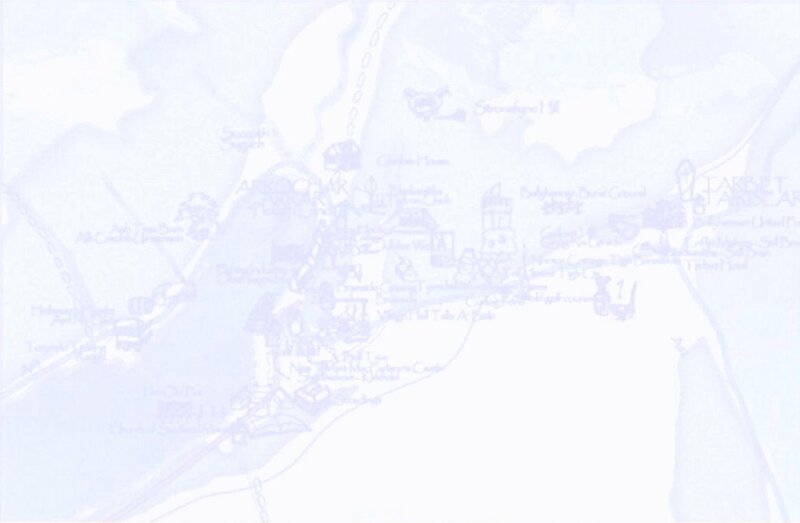 They lived at Cruachan. They also built the extension to the right in 1984. Cruachan was sold in 2001. 2004 Wallace Arnold/Sheerings bought the hotel and carried out extensive refurbishment throughout. They changed the name to The Claymore Hotel. 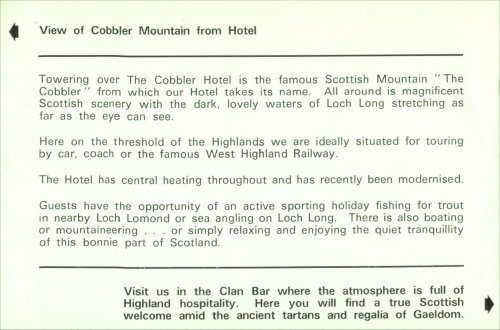 Here is a brochure from 1969/1970 for the then Cobbler Hotel. First that some Vikings were buried just inside the front gate at Loch Long on the left hand side. 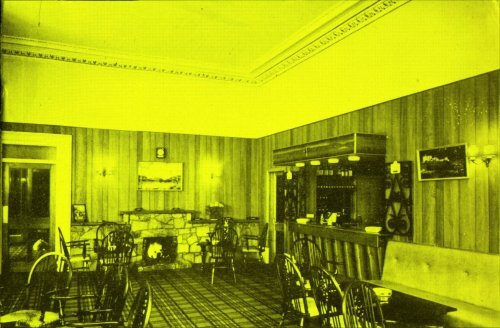 Second that there are ghosts of a green lady and a black dog connected with the hotel.